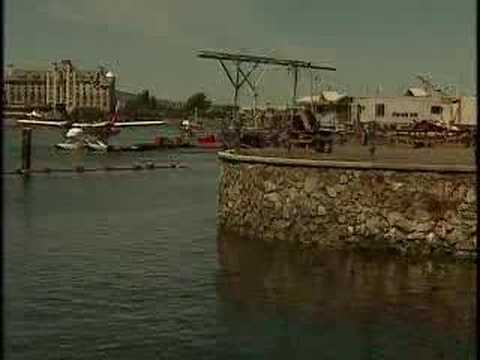 Steve Nash is NBA Most Valuable Player Steve Nash of the Phoenix Suns was named the winner of the Maurice Podoloff Trophy as the NBA’s Most Valuable Player for the 2004-05 season, the NBA announced today. The 6-3 point guard, who returned this season to Phoenix where he spent the first two years of his career, totaled 1,066 points to narrowly edge out Shaquille O’Neal (1,032 points) of the Miami Heat in MVP voting. The 34-point difference is the fourth-closest voting margin since media began voting on this award in 1980-1981. Rounding out the top-five in voting for MVP were Dallas’ Dirk Nowitzki (349 points), San Antonio’s Tim Duncan (328 points) and Philadelphia’s Allen Iverson (240 points). By electing Steve Nash the NBA's Most Valuable Player, the pro basketball media made the day of everyone who plays hoops on Friday and protests the US war machine on Saturday. 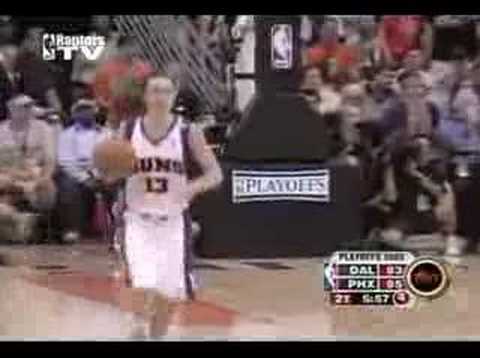 First and foremost, Steve Nash deserved this award. He averaged a league leading 11.5 assists a game and shot 50% but that doesn't even begin to explain his value to the Phoenix Suns. Comprehending Nash's season with stats alone is like judging the merit of a deep-dish sausage pizza by its calorie content: it's just more complicated than that. Beyond statistics, the six-foot tall Canadian point guard led the Suns to one of the great turnarounds in NBA history. 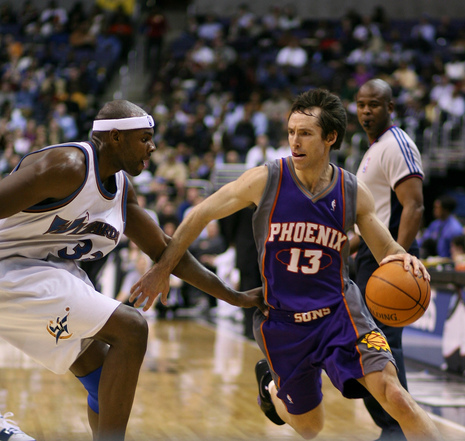 After signing as a free agent from the Dallas Mavericks, Nash grabbed the Suns and yanked them from a terrible 29 wins to an NBA-leading 62. He took a horrible squad and made it a great one with an Energizer Bunny style of play that led Phoenix to score more points than any NBA team in a decade: over 110 points per game. Nash's "most valuability" was perhaps most clearly demonstrated during one five game stretch when Nash was injured. Without him, the Suns limped through five straight losses scoring just 97 points per contest. NASH'S play seems inspired by his first athletic love, soccer, and not coincidentally, Nash showed the world that basketball could also be "the beautiful game." Nash barely won the MVP, edging out Miami Heat center Shaquille O'Neal in a squeaker. His victory shocked some observers because it's Shaq who fits in with the NBA's marketing strategy of pushing forward individual superstars at the expense of team play. Nash, on the other hand, invited all of his Phoenix Suns teammates up to the podium with him when he accepted the MVP. 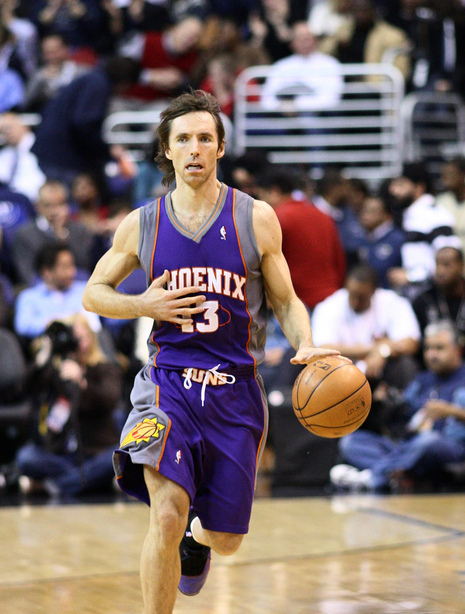 On Sunday, Steve Nash became only the 2nd international player, and first-ever Canadian, in the history of the NBA to earn the NBA’s Most Valuable Player Award. In one of the closest votes since the media started determining the winner in the 1980-81 season, Nash edged out Miami Heat Centre, and perennial MVP candidate, Shaquille O'Neal. As a Canadian National Team player, Nash competed in 99 international games. A consistent leader in points, assists and minutes played, Nash’s contributions have lifted Canada to tremendous international success, including a 7th place finish at the 2000 Sydney Olympic Games. In 2003, Nash was named MVP at the FIBA America’s Olympic Qualification Tournament, where Canada competed to a 4th place finish. 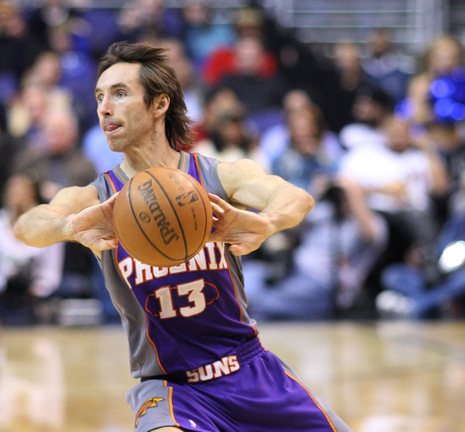 After six years with the Dallas Mavericks, Nash’s presence on the Phoenix Suns this year helped to launch them into a first place regular season finish, improving their record from 29-53 to 62-20. Averaging 15.5 points per game and a league best 11.5 assists on the regular season, Nash has kept similar stats in the post-season thus far with 15 points per game and 11.3 assists.